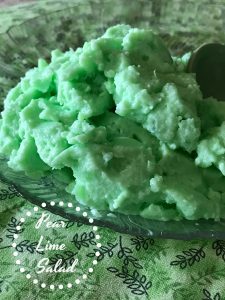 Pear Lime Salad, sometimes called Seafoam Salad has been around for as long as I can remember. The first time I had this salad was at my sister-in-laws house, when she was giving a graduation for her daughter. I had never had this salad before but it made a regular appearance at all of her family’s get togethers. Her family also made a layered pistachio dessert that is fantastic. I’ll be sharing that in the very near future…so stay tuned. The original recipe I received many years ago, and I’m talking like 30 years ago (back in the 80’s) the health craze had just started to take hold. 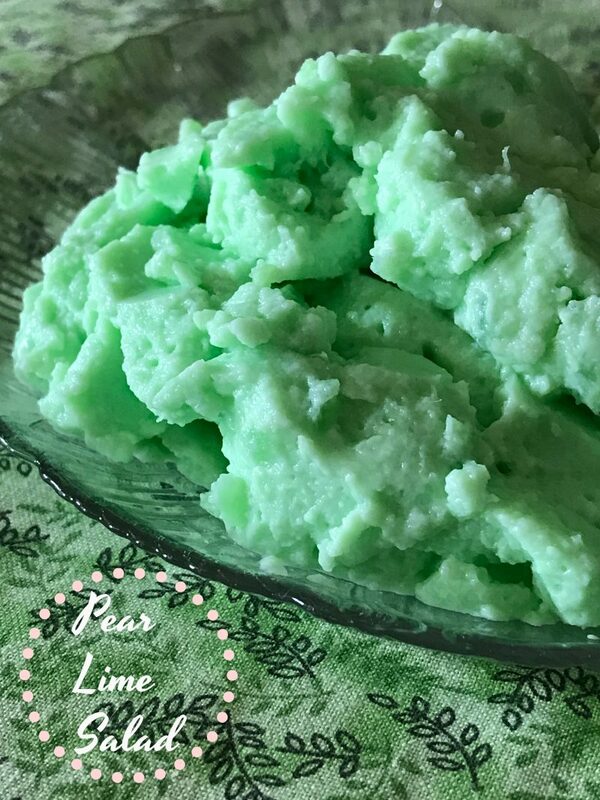 The original recipe calls for using “regular” ingredients but I decided to cut the calories in this recipe by using sugar-free lime jello, pear halves in water or light juice, reduced-fat cream cheese, and reduced-fat frozen whipped topping. Pear Lime Salad turned out fantastic and full of flavor. This “green” salad would be great served on St Patrick’s Day, Easter or Christmas but it’s also great to serve for any occasion. It’s extremely light and fluffy making it perfect to serve as a light dessert after a large, heavy-style dinner. Another plus, kids really seem to love this salad. I’m not sure if it’s because it’s “green” or just because it tastes good but whatever the reason is, this salad will disappear fast! 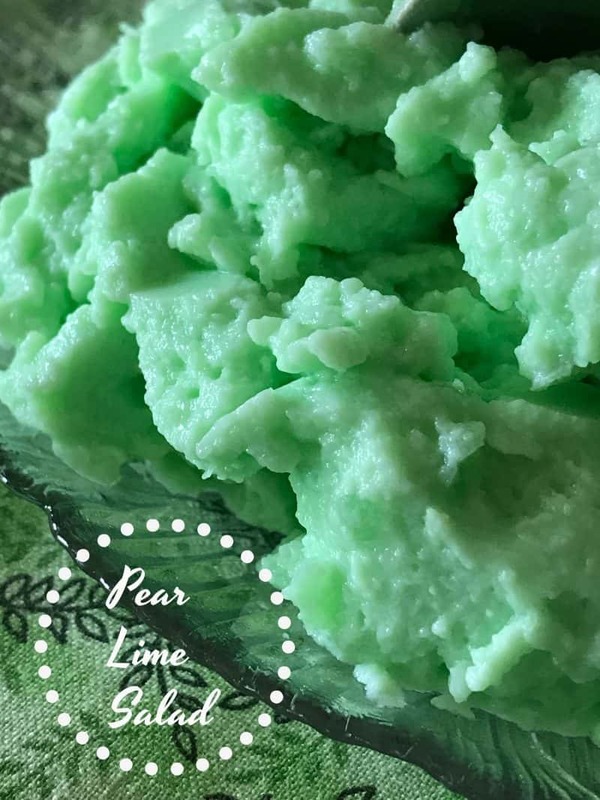 Pear Lime Salad aka Seafoam Salad is light, yummy and “foamy.” This salad can also be made in a jello mold for a whimsical look. 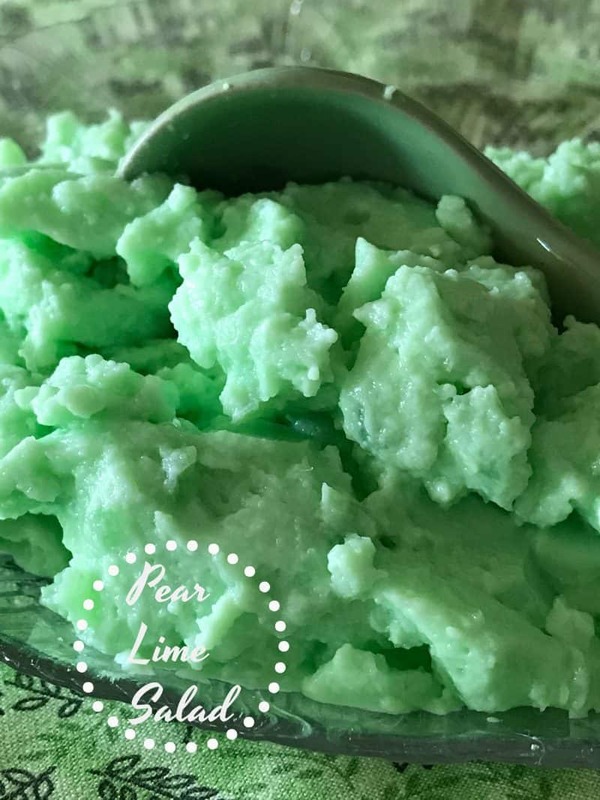 Whisk together the lime gelatin and boiling water in a large bowl until the gelatin dissolves. Add the pear halves and cream cheese. Using an immersion blender or hand mixer, whip together until smooth. Gently whisk in the whipped topping. Refrigerate until firm, at least 4 hours. Here is another favorite of ours Frog Eye Salad. Made with pasta, mandarin oranges, pineapple and lots of other goodies.